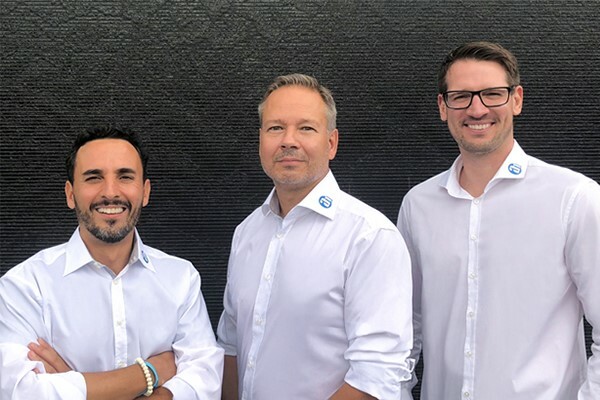 NEU-ANSPACH, Germany – Adam Hall Group promoted Gabriel Medrano (pictured here, left) to COO Adam Hall North America; Markus Jahnel (center) to COO and Managing Director, and Marcel Mieger (right) to Sales Director Europe. Bodo Falkenried, credited with the creation and development of Adam Hall Asia Pte Ltd, is retiring. As a global provider of integrated event technology solutions, the rapidly growing Adam Hall Group responds to its continued business development with further expansion to its sales team. Markus Jahnel, COO and Managing Director, will assume responsibility for the Adam Hall Group’s global business development with immediate effect. “The long-term development of new business areas and partnerships and the development and personal maintenance of our global networks are important priorities for the immediate future. I am looking forward to being even closer to our marketplace expansion,” said the 50-year-old, who has been with the company over 27 years. With the handover of this strategic area to Jahnel by the end of September, the Adam Hall Group also bids a warm farewell to the retiring Bodo Falkenried (68). Falkenried’s achievements include in particular the creation and expansion of the Group’s local business unit, Adam Hall Asia Pte Ltd. “We would like to thank Bodo for his great work and wish him all the best for the new chapter in his life. He was a valued employee who was greatly appreciated by the entire team,” expresses Markus Jahnel. Marcel Mieger takes on the role of Sales Director Europe at the beginning of September. A member of the Adam Hall Family for 16 years, he has contributed to the successful multi-channel management of sales and the high level of customer satisfaction. The 34-year-old will look after the ever-expanding European sales network of the innovative event technology solutions provider. Gabriel Medrano takes over as COO of the newly formed, New Jersey based Adam Hall North America, Inc., another subsidiary and local business unit of the Adam Hall Group founded in January this year. Together with Steven Savvides, President, Adam Hall North America, Inc., Medrano is responsible for the development of the entire business in North America. The 43-year-old has demonstrated his technical expertise and leadership qualities for the company over the last ten years, most recently as International Sales Manager for Southern Europe & South America. Gabriel Medrano, COO, Adam Hall North America, Inc.